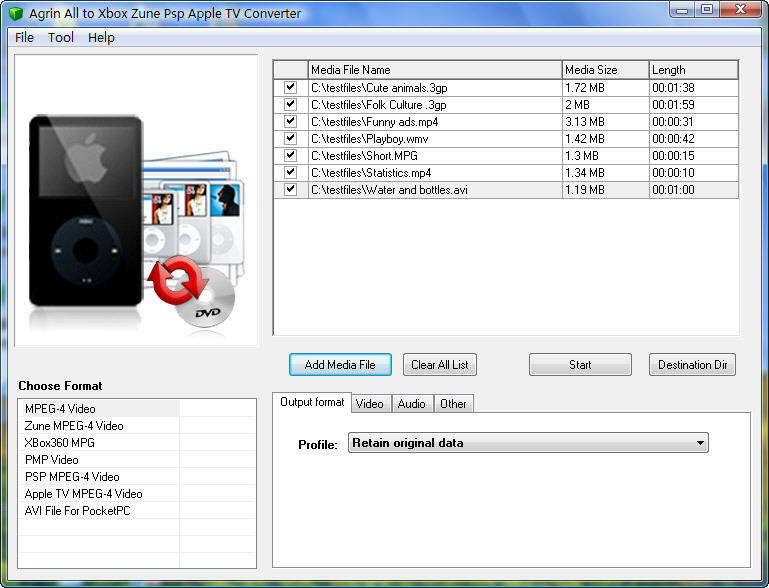 Agrin All to Xbox Zune Psp Apple TV Converter is a powerful and easy-to-use utility which can meet your needs that convert video files to other versatile video files. No other software like it can help you convert video files including AVI, WMV, MPEG, MPEG4, ASF, VOB, 3GP, iPhone, MOV, FLV to MPEG4, Zune, Xbox, PMP, PSP, Apple TV, Pocket PC at the best quality. ...... To save time, It allows you to finish different file formats once in batch. You can set encoding parameters including video size, video quality etc. Hold the chance and it has an unbeatable price! It offers trial version and you can free download it! Qweas is providing links to Agrin All to Xbox Zune Psp Converter 4.2 as a courtesy, and makes no representations regarding Agrin All to Xbox Zune Psp Converter or any other applications or any information related thereto. Any questions, complaints or claims regarding this application Agrin All to Xbox Zune Psp Converter 4.2 must be directed to the appropriate software vendor. You may click the publisher link of Agrin All to Xbox Zune Psp Converter on the top of this page to get more details about the vendor.